I'm so excited to be stop number 21 on the Holiday Housewalk 2017! 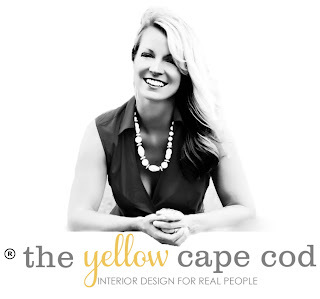 This is the fourth year I've been a part of this inspiring online home tour presented by Jennifer Rizzo. This year, I'm taking a new approach. 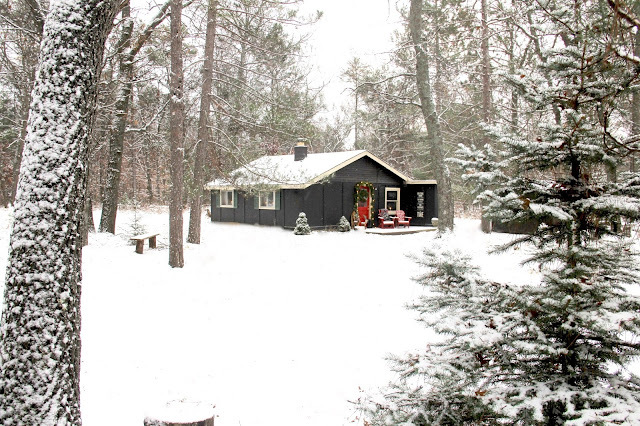 Instead of sharing my home, I'll be sharing our family cabin located in the woods of Northern Michigan all decked out for the holidays. If you're visiting from Beneath My Heart, welcome! I was so happy to hear that I would be following Tracy's tour, she is one of my favorite Bloggers! 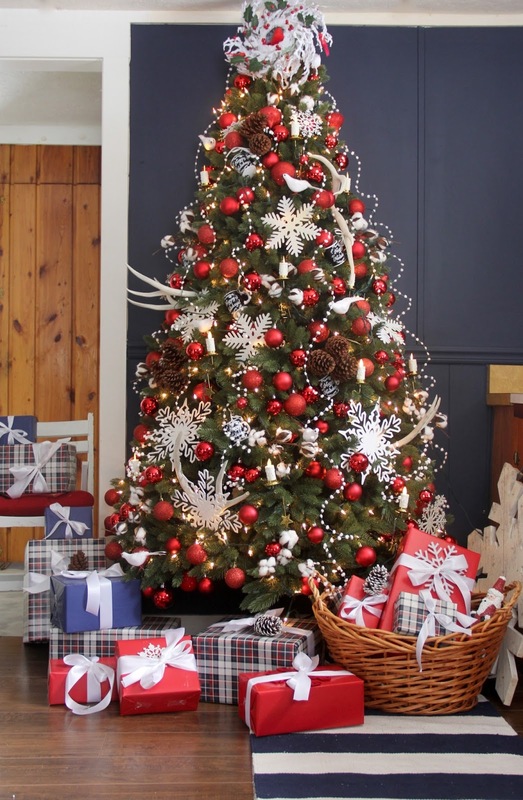 I look forward to her holiday decor and to seeing how her sweet family is celebrating the holidays every year. If you didn't stop by as part of the tour, please be sure to hop on here to go back to the beginning for the full experience. 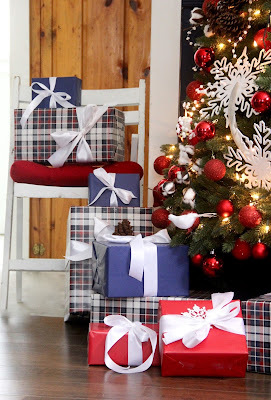 Christmas at The Blog Cabin! 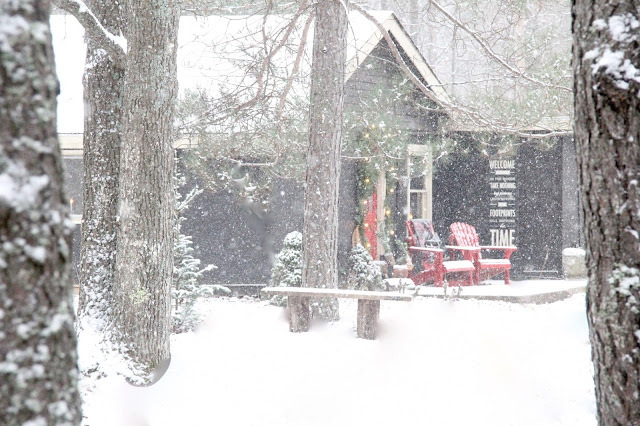 The Blog Cabin is a teeny-tiny, rustic, cabin nestled in the woods of northern Michigan. I've been busy renovating it over the past year (click here for the full story and before pics). This little gem has been in my family for decades. It's one of three cabins on my parents property, but for the last few years this particular home has been closed up and used for storage. 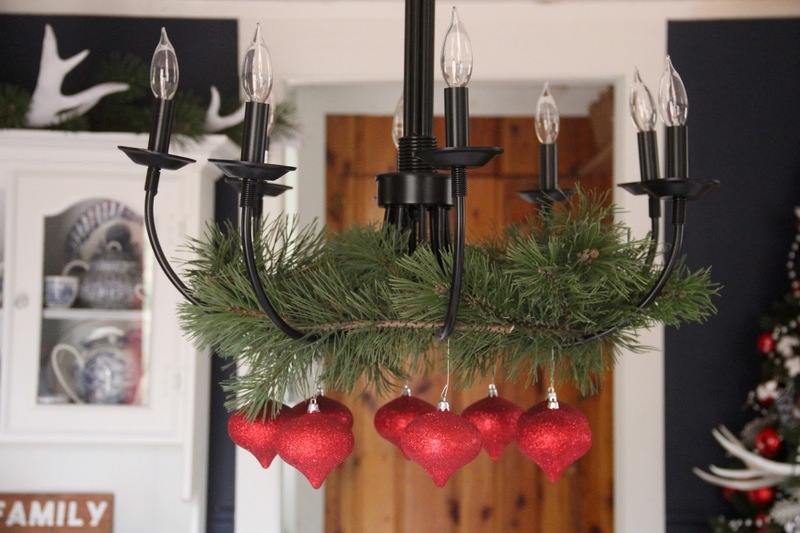 I've taken on the challenge to bring it back to life, one budget friendly, DIY project at a time. The renovations are not fully complete, but it's close and we're so in love with the little cabin that we decided to spend Christmas here! Today, I'm going to take you on a virtual road trip up north! The past few weekends I've been making the journey back and forth, preparing the cabin for our family holiday. 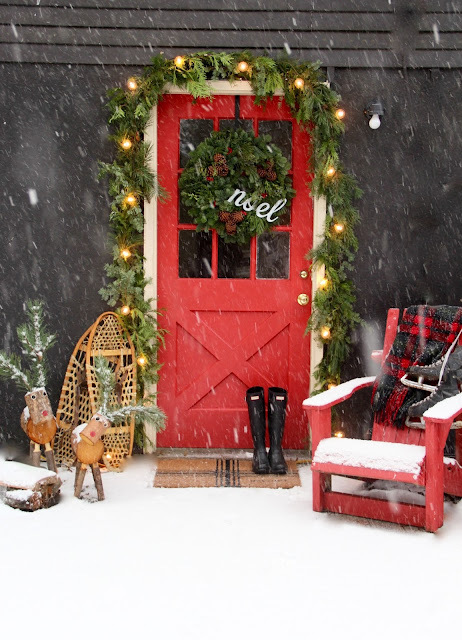 Using Christmas decor from Christmases past, family heirlooms and fresh evergreen clippings from the property, The Blog Cabin has officially been transformed into a winter wonderland. 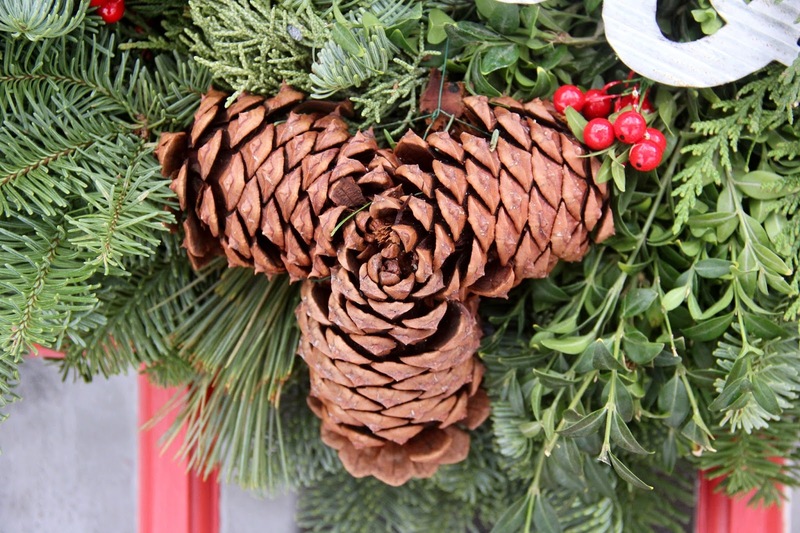 I enlisted my Mom to help me decorate the front porch. We started with a mixed green garland from the greenhouse and filled in with clippings from the evergreen trees around the property. 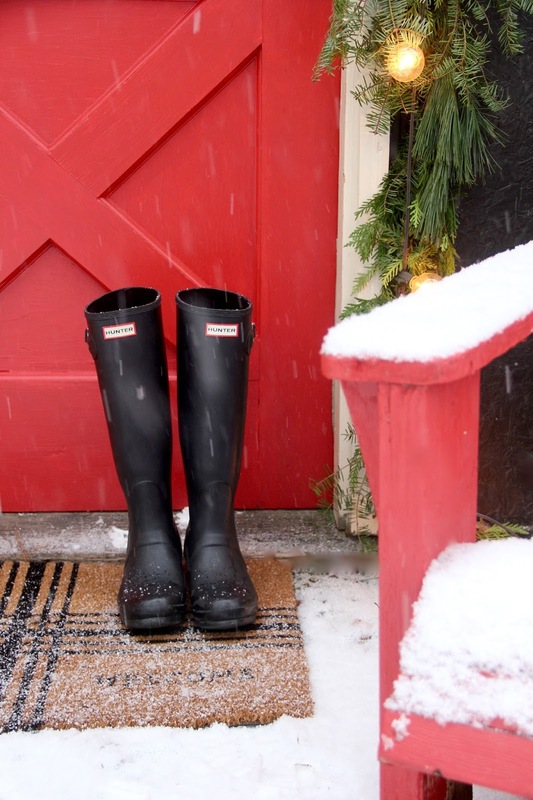 The day we began decorating the porch, Mother Nature decided to make an appearance with the first official snow dump of the year. 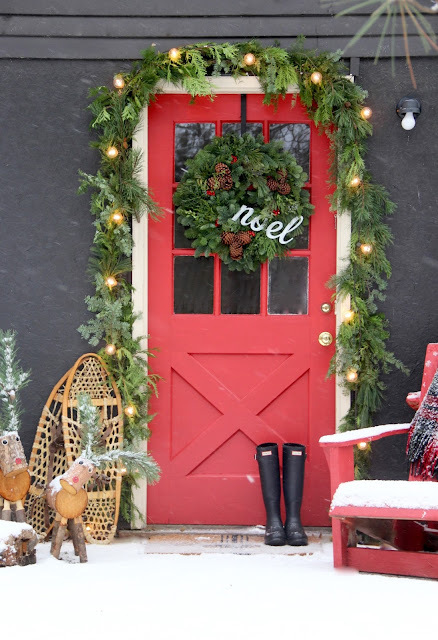 Last year, when I began the cabin renovations, one of my first visions was the front door painted red and decorated for Christmas. This vision finally came to life after a coat of Ace Hardware Paint, "Davids Sweater", fresh greens and a few woodland inspired accessories. To give the traditional decor a little bit of a modern vibe, I incorporated over-scaled lights. I used outdoor patio string lights from Home Depot to illuminate the greenery around the door. I brought up the little chopped wood deer my hubby bought a few years ago. They were so cute on our front porch at home, but they were made to be here. I placed them next to a pair of vintage snow shoes. 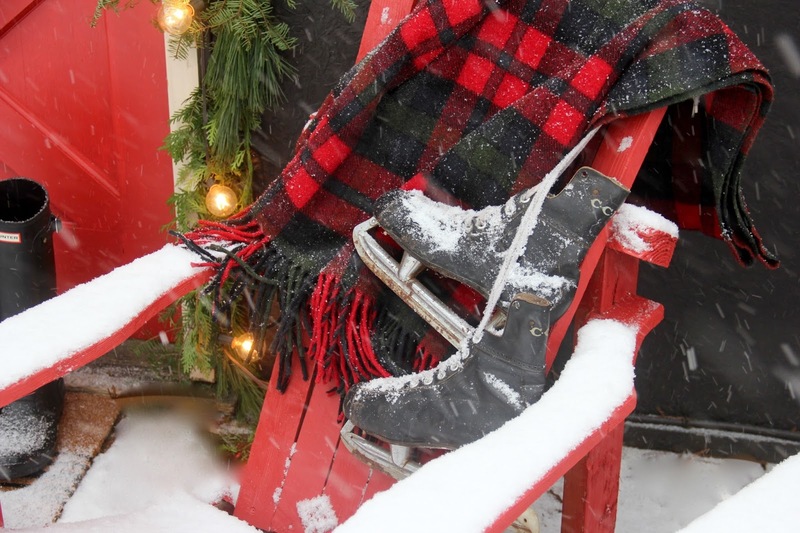 I raided my Mom's vintage home decor stash and cozied up an old adirondack chair that I painted red, with a wool blanket and old ice skates. Now that you've seen the outside of The Blog Cabin, come inside out of the snow storm and warm up with a cup of coffee (or hot cocoa if you're a kid). Just inside the cabin, I set up a convenient hot beverage station. 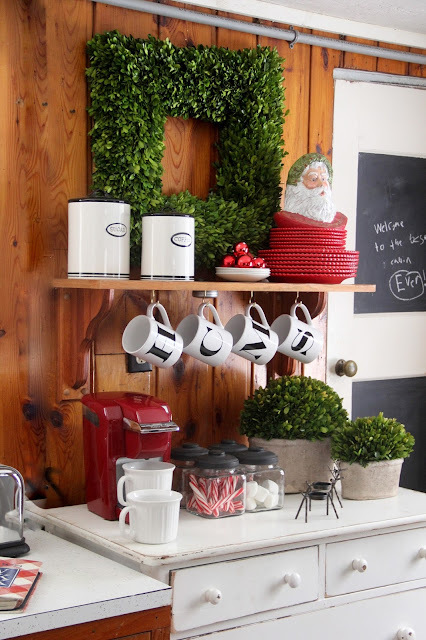 Everything you need for a hot beverage can be found here. Adult libations are stored inside the drawers of our beverage dresser if you would like to add a shot of Baileys...it's always 5:00 at the cabin. 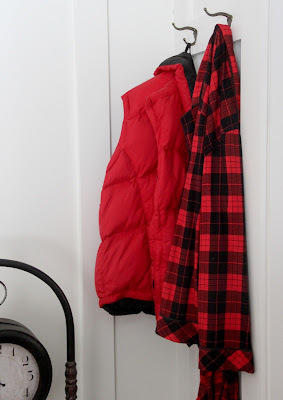 Once you have your hot tottie in hand, step over to the coat rack and hang your coat and hat next to my Dad's. Stepping into the Living Room, you may be tempted to grab a quilt from the ladder. 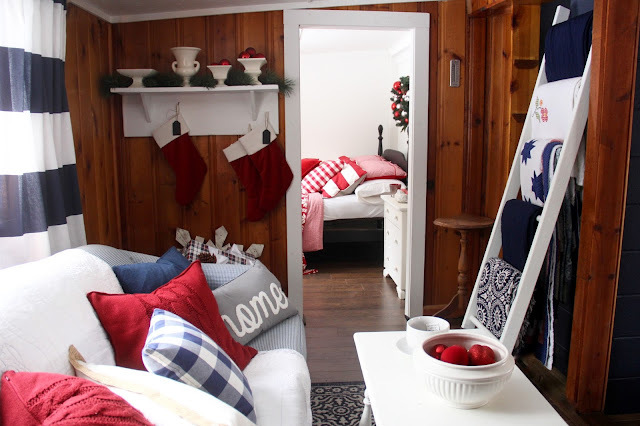 This is by far the most cuddle-worthy room in the cabin. Although the sofa is small, it can handle lots of snugglers. The vintage bed in this room has been in the cabin since the day my parents purchased the place years ago. My sister gave it a quick update with a coat of home-made black chalk paint. My Christmas PJ's are hanging in the corner along with a fully stocked magazine rack all ready for a weekend of R and R.
You can never have enough blankets at the cabin. The bed is dressed in layers of cozy pillows and covers in shades of red. 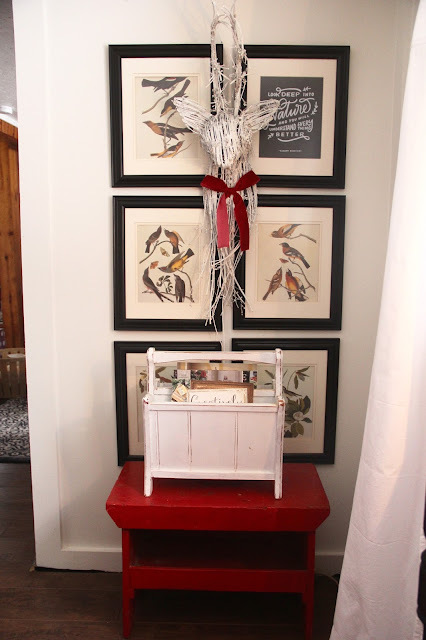 Back in the Living Room, an old shelf in the corner acts as a mantle stand in. 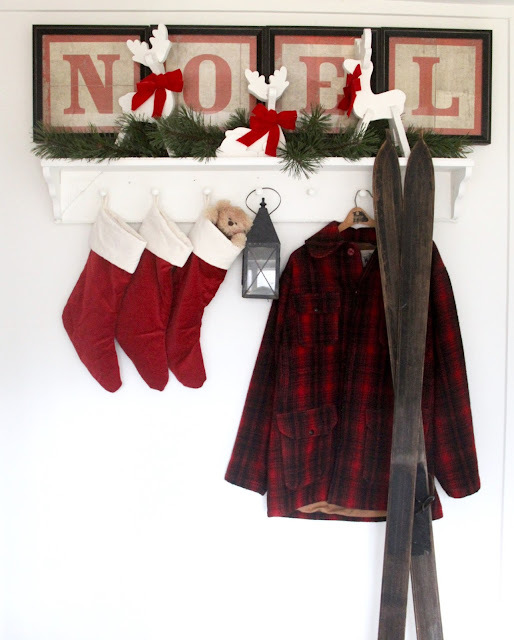 We don't have a fireplace at The Blog Cabin, so I used this little area to hang our stockings. The renovations in the kitchen are coming along, but not yet complete. I haven't installed the appliances yet, which means we'll need to use the fridge and stove at my parents (the main cabin). On the bright side, this minor inconvenience is balanced by the perk of having an open spot for full sized Christmas Tree! Our Balsam Hill Christmas Tree fits perfectly in the refrigerator spot. This tree is actually only half a tree, it's completely flat on the back which makes it great for a high traffic area. 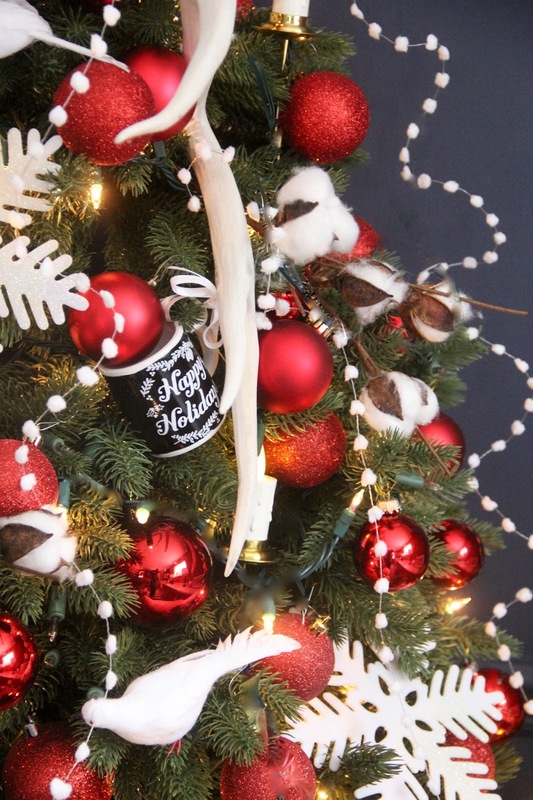 I applied a nature theme to the tree decor. Snowflakes, birds, pinecones, cotton branches, antlers, and pom pom garland cascading down the tree to mimic the look of falling snow. I found some really cute ornaments and wrapping paper in town at the local shop we call "The Merch". One of my favorite areas of the cabin is in the dining room. 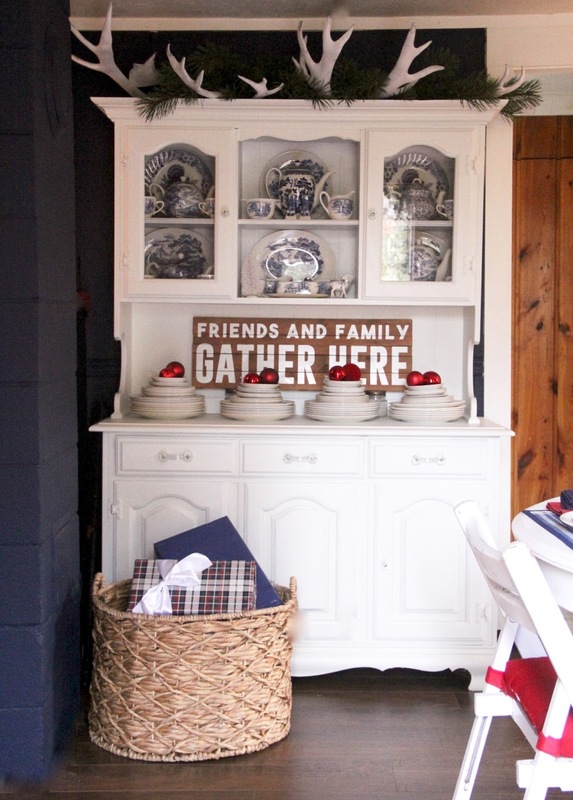 My Mom styled this hutch using a collection of heirloom dishes. 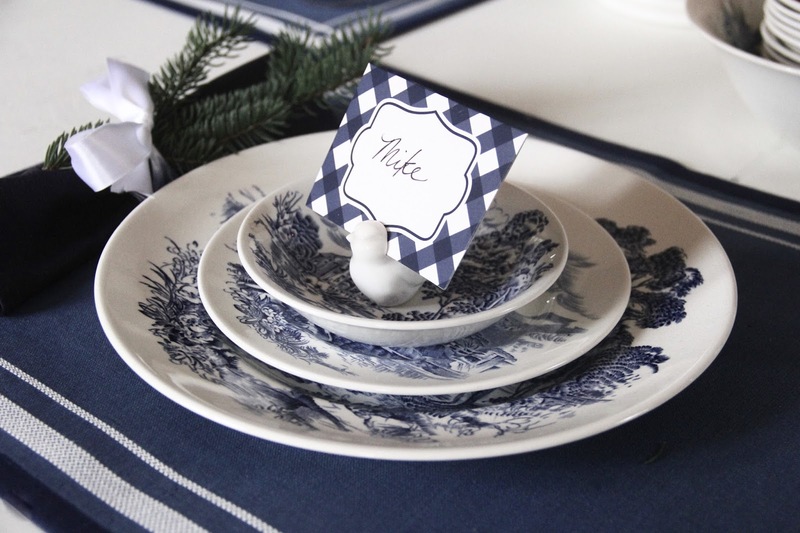 This blue transferware has been in our family since her Grandmother started collecting it. The first pieces my Great Grandmother acquired came in her Laundry Soap. 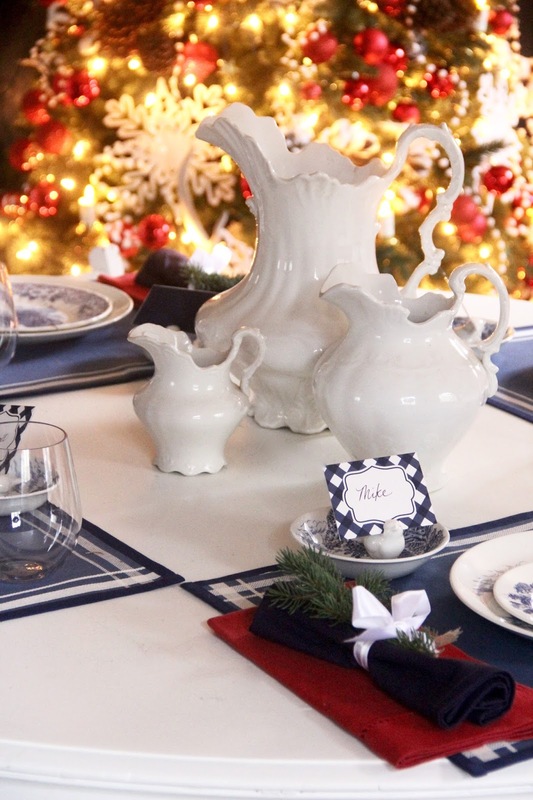 I also used the dishes to set the table for our Christmas dinner. Our plans for our holiday celebration at the cabin include lots of cooking. Although most of it will take place at the main cabin this year, we will definitely be consuming it over in The Blog Cabin. One of my goals in the cabin renovation process was to use things we already had. For instance, this little dresser in the kitchen was already here. 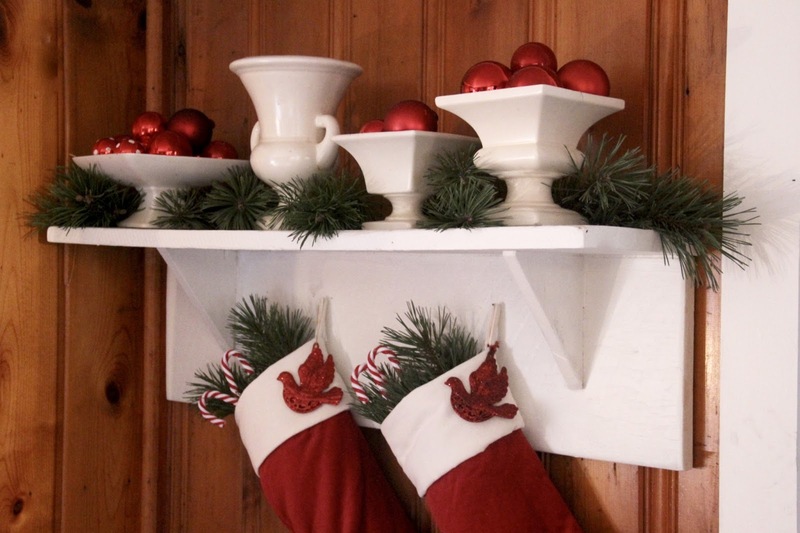 I gave it a fresh coat of paint before using it as a place holder for a stove. Until we have appliances, the beverage center will come in handy. 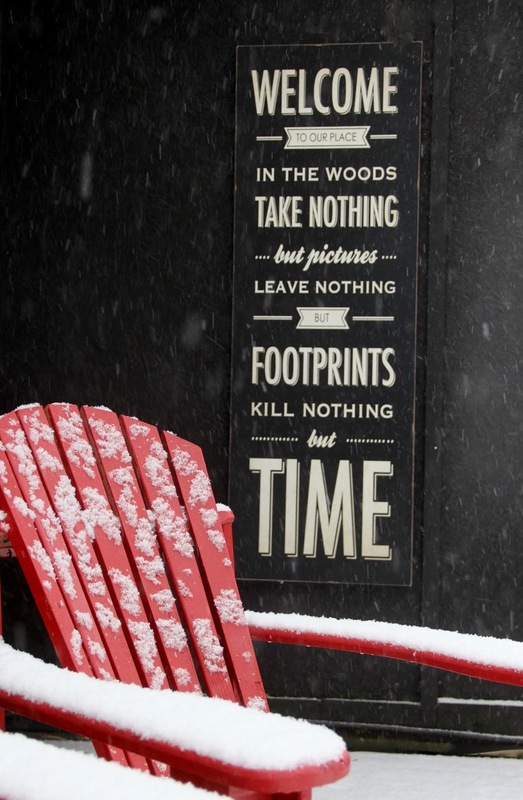 Especially after a long day of playing out in the snow. 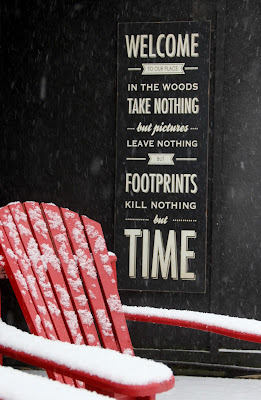 On the agenda for our Christmas at The Blog Cabin are lots of outdoor adventures. 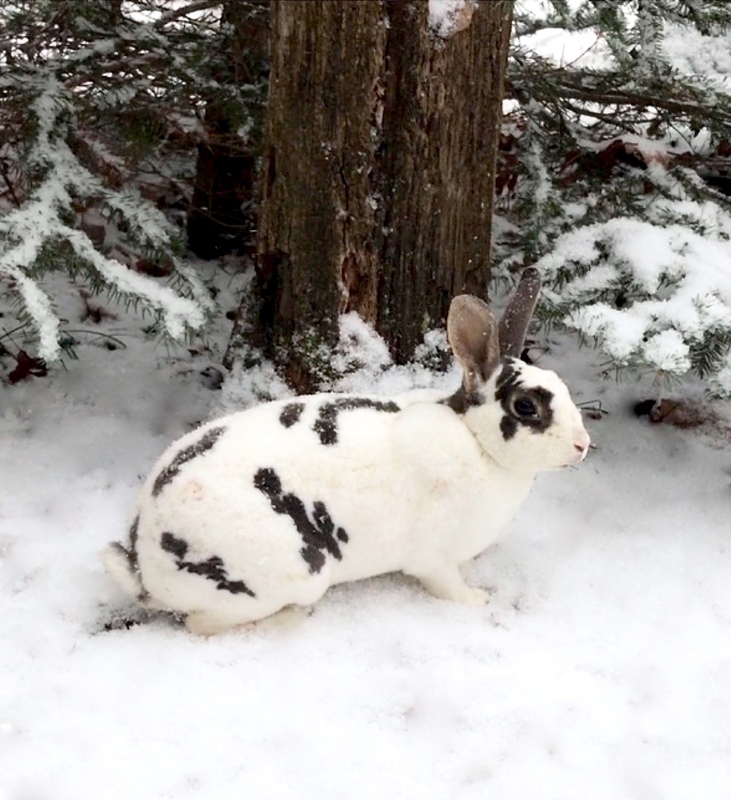 Chasing bunnies, sledding, snowmobiling, building a snowman with Grandma, snowshoeing through the woods are all on the list. Thank you so much for visiting today and allowing me to show you around the Blog Cabin. If you would like to follow along on this renovation project, please visit the original blog post here. Also, you can catch lots of sneak peeks and video clips of my cabin makeover adventures over on my Instagram. Safe travels home my friends. Drive careful...watch out for Deer! Now, it's time to continue the Holiday Housework over at Just Destiny's house. Destiny has an amazing Christmas decor aesthetic. Every year she does something different, and every year she blows me away with her creativity. Thank you, Jen Rizzo, for inviting me to join the Holiday Housewalk 2017! Wow, that was a treat. Max is right. 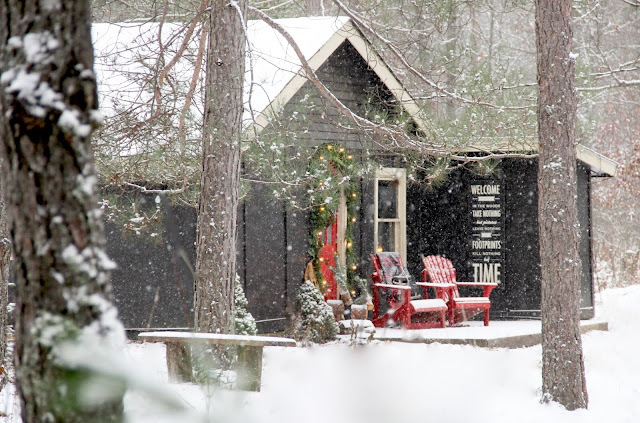 It is the best (Christmas) cabin ever. 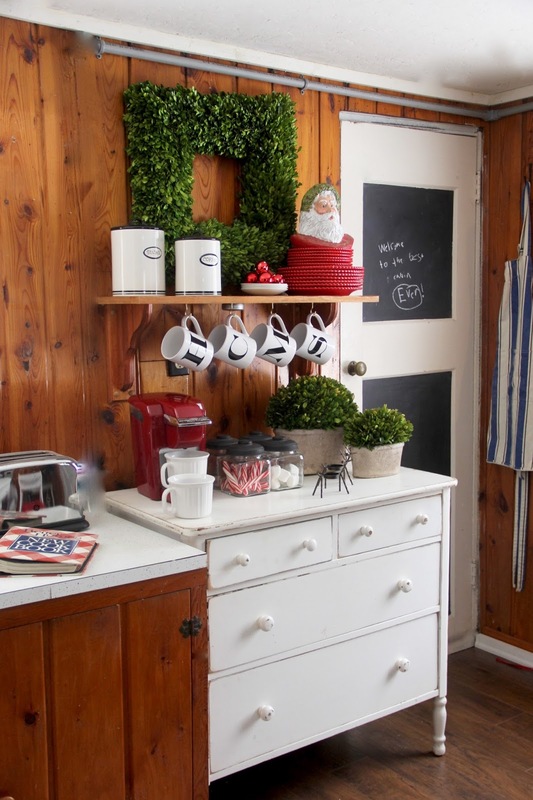 I love that dresser in the kitchen and the hutch and front entrance, especially. How neat to have a cabin like that. It's just beautiful! What a fun Christmas tour! 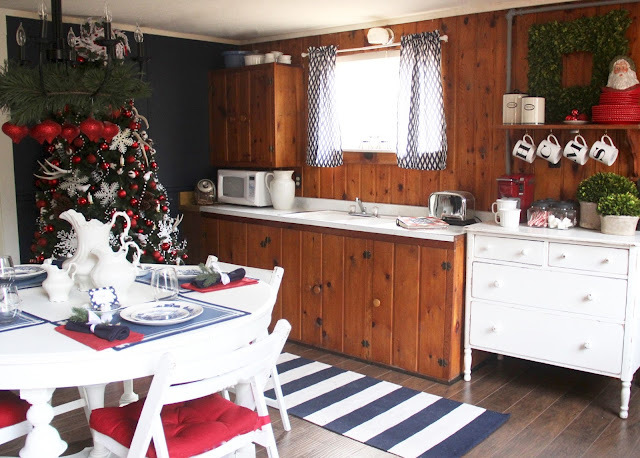 The cabin is just adorable and I can see why you've decided to spend your Christmas there. Every square inch of it is beautiful and charming. Thanks for sharing it! sarah, i am in LOVE! 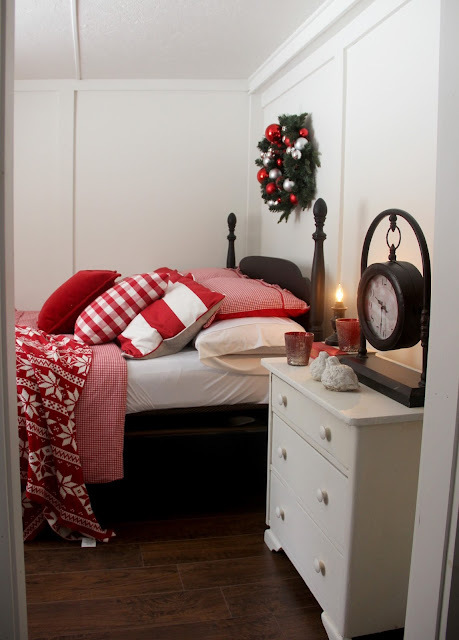 this is my dream cabin- the exterior is adorable and christmas there sounds so fantastic! what a special place you've created. thanks for sharing it with us! I'm moving IN! 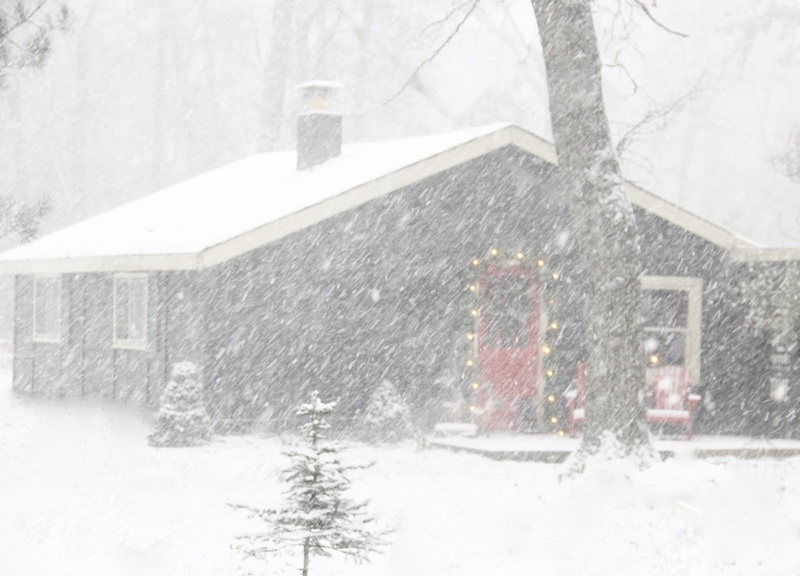 It's the definition of a Christmas cabin! I mean its even snowing:0) I can just imagine myself right there! I bet you are LOVING it so much. It's just dreamy girl! 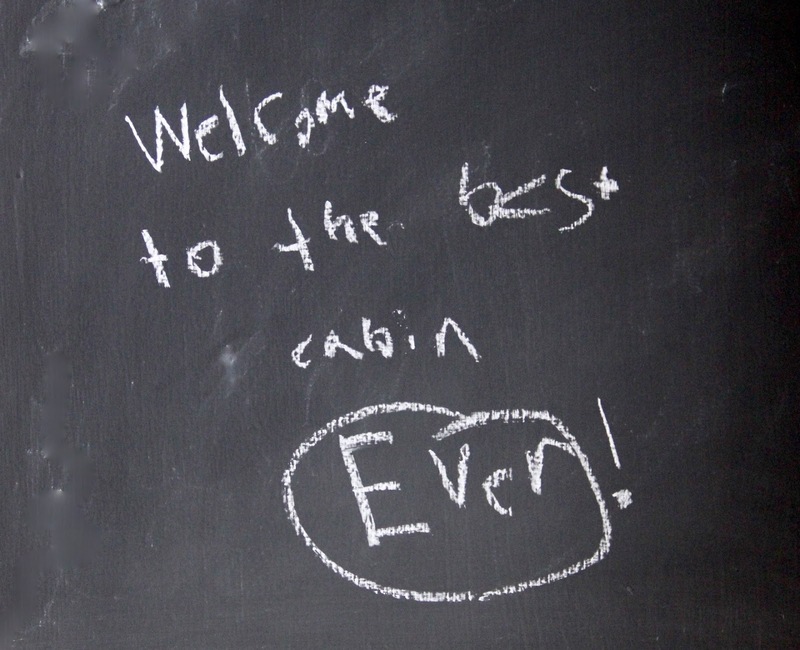 Wow that really is the best cabin ever! I hope Santa brings me a cabin for Christmas! 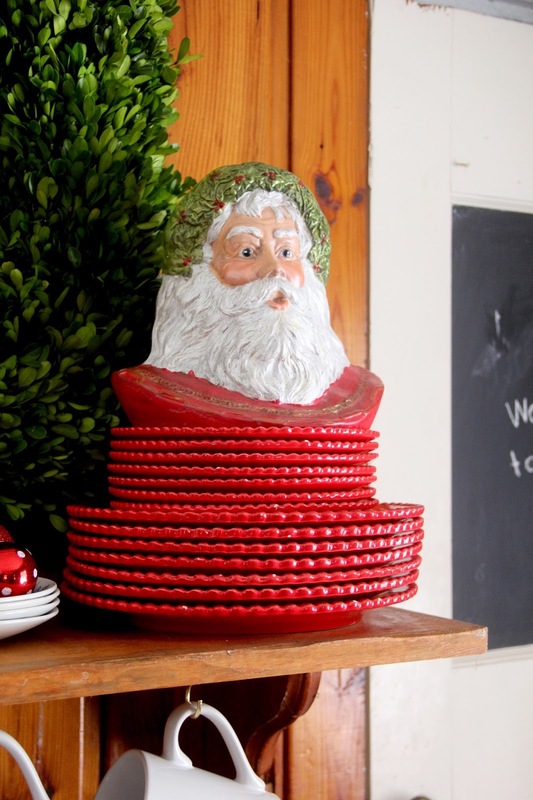 This is one of my very favorite Christmas home tours ever! Every little detail is pure happiness. What a special place to get away to! Merry Christmas to you and your sweet family, Sarah! 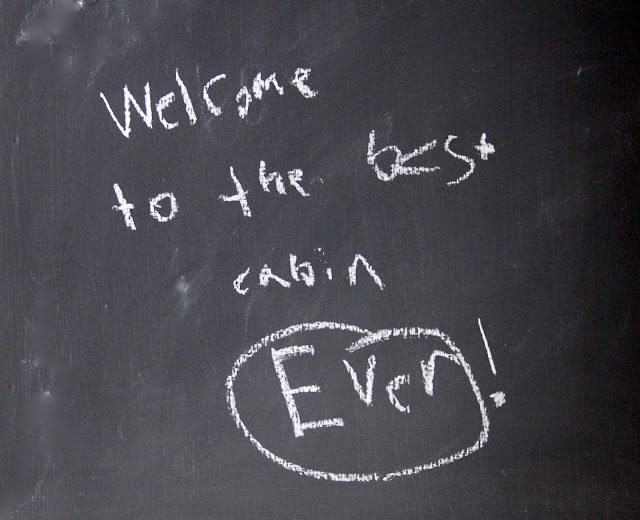 You did an amazing job creating a delightfully warm and welcoming cabin for your family. I love all that you did - and just looking at the photos makes you feel all warm and fuzzy inside. The perfect place to celebrate Christmas! Thank you so much Lala! Merry Christmas! THank you for sharing a part of your family history with us. 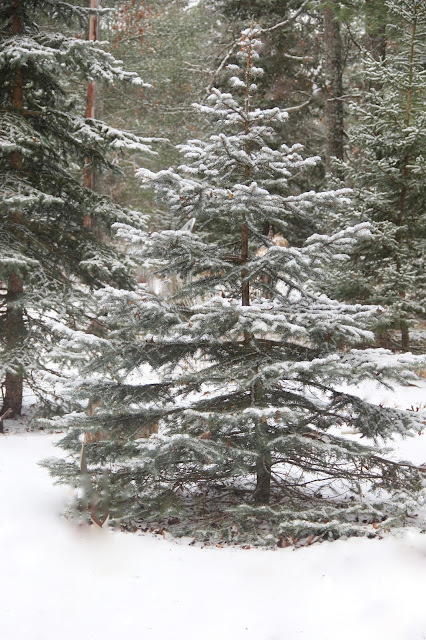 Christmas at the cabin sounds wonderful! Merry Christmas! Thank you for stopping by and letting me share. Merry Christmas to you!! What an amazing place to make new Christmas memories. How fortunate to have that treasure! You've decorated it beautifully! Thank you Shannon! We are very lucky to have this place in our family. I'm grateful that my parents let me take on the Blog Cabin project. Merry Christmas! 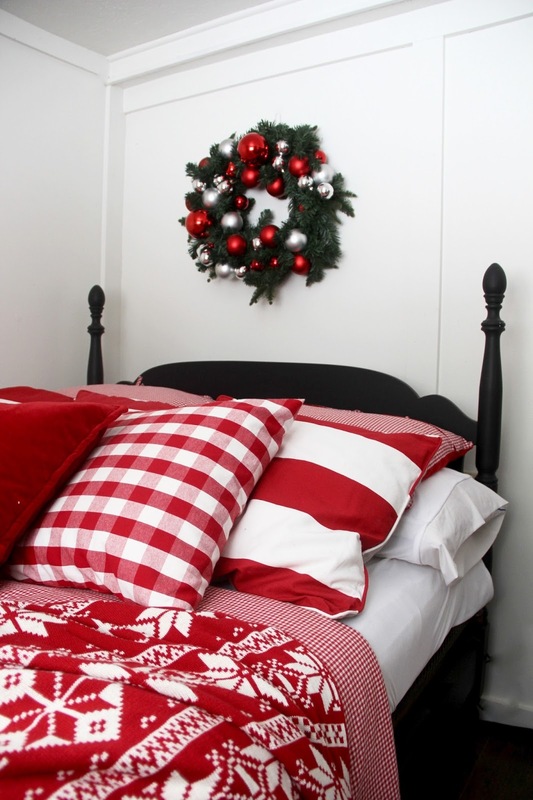 oh sarah- what a wonderful place to create all of the Christmas memories for you and your family. I will be sure to follow along on the rest of the renovation journey. happy holidays. Thank you Laura! 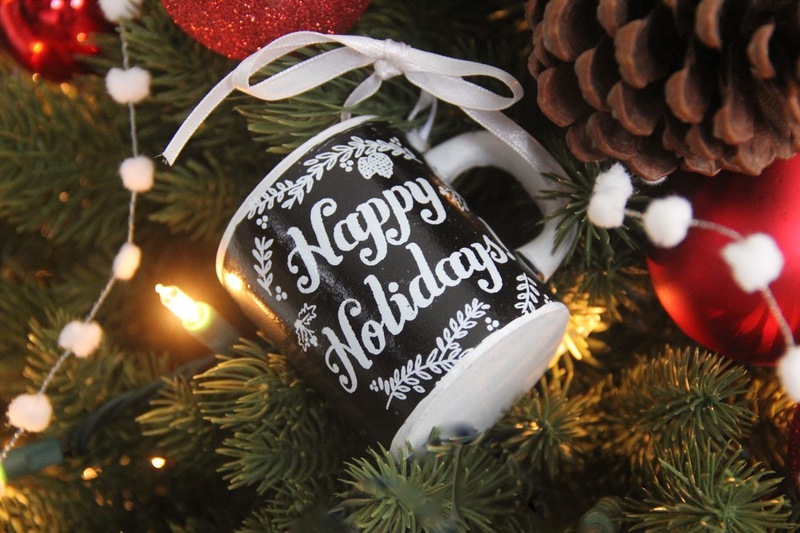 Happy Holidays to you too!! You've take the cabin of my dreams and made it reality! So so gorgeous! Oh my goodness this has to be the cutest cabin ever! I love all the red and that porch is beautiful, have fun creating memories! Thank you Kristin! Merry Christmas to you and yours! Looks beautiful, Sarah. I can’t believe how different the place looks! Cozy and gorgeous. Thanks Cherise! I'll have to have you back up for a visit! Oh my gosh! I am dying over this cabin!! We would seriously be there ALL. THE. TIME. You have it decorated so cute! Everything is beautiful! I love that you have your grandmother and great grandmother's dishes. Priceless!! Merry Christmas, Sarah! Thank you Traci! 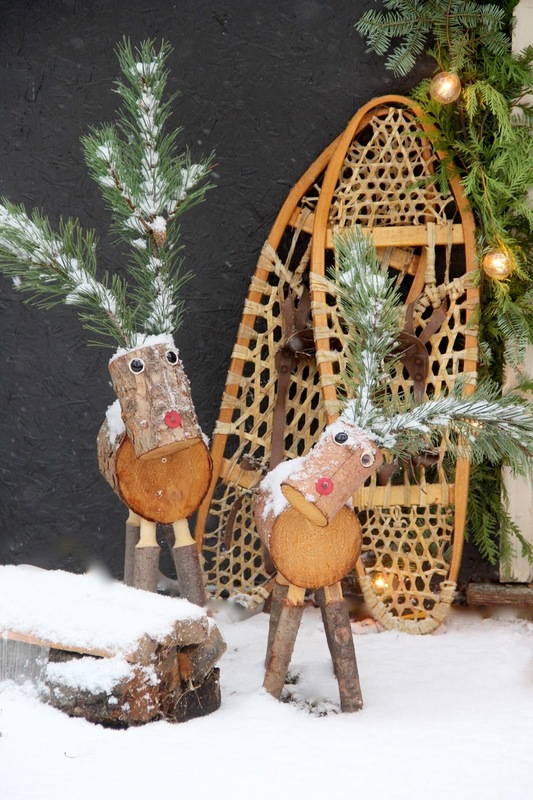 Merry Christmas to you and your adorable family! Thats awesome Cindy. Thanks for stopping by! 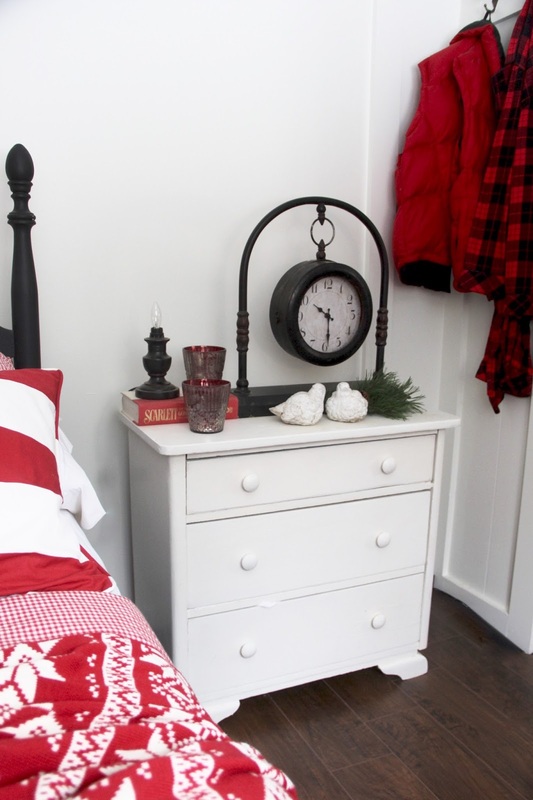 I just found your blog via Pinterest and just love what you are doing with the cabin. Everything is just so vibrant yet cozy. And, who doesn't want a hot toddy when they come in from the cold, yum! I'll be stopping back for more inspiration! 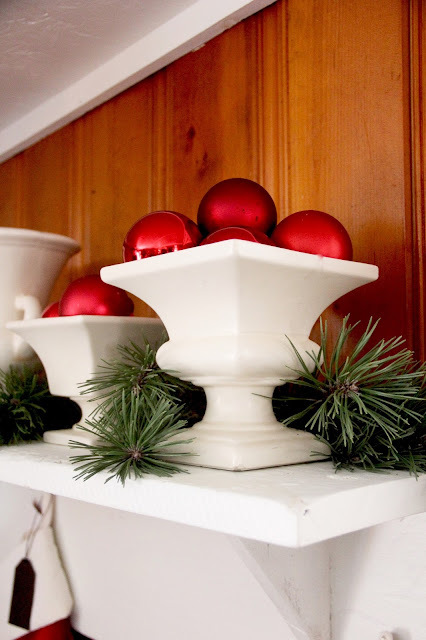 Can you tell me where you got the round barrel planter you use as the Christmas tree stand in your 2015 photos? Hi Wynona, it was from Ballard Designs.